After relegation from League One last year, Crawley Town have found life tough going on their return to League Two. The Red Devils made a change off the field before the start of the new campaign, appointing former Cheltenham boss Mark Yates as their new manager, and things looked good with a promising 1-1 draw at Oxford first up. AFC Wimbledon ran out 2-1 winners in Crawley’s first home game, but another decent point, this time when Portsmouth visited the Broadfield Stadium, preceded a morale-boosting and impressive 3-0 triumph at Cambridge. Another good draw against Wycombe followed, but that was to prove something of a false dawn as Crawley then suffered four defeats on the bounce, only scoring once and conceding 12. They rectified that somewhat, triumphing 3-0 at Newport before two more losses against Plymouth and Southend, although confidence was restored last weekend, as they beat high-flying Leyton Orient 3-2. Yates made some change to the playing squad, bringing in the likes of Jon Ashton, Lee Barnard, Roarie Deacon, Luke Rooney and Simon Walton, while striker Izale McLeod left for Notts County and Joe Walsh moved to MK Dons. The boss has utilised the loan market recently too, bringing in Birmingham defender Mitch Hancox and Ipswich defender Josh Yorweth, plus Oldham forward Rhys Murphy and Watford midfielder Ross Jenkins. Team news: Luton will be without Paul Benson (neck) again, as Stephen O’Donnell (ankle) remains a doubt. Paddy McCourt is back from international duty though, while Craig Mackail-Smith should be fit and Scott Griffiths is in contention too. For Crawley, Lanre Oyebanjo (knee), Gavin Tomlin (groin) and Joe McNerney (knee) are sidelined but Liam Donnelly and Josh Yorwerth are back in contention following their returns from international duty. Goalkeeper Freddie Woodman has returned to Newcastle after Tim Krul was ruled out for the rest of the season too. Top scorers - Hatters: Jack Marriott, Cameron McGeehan (6). Red Devils: Gwion Edwards (5). Milestones: If selected then Pelly Ruddock Mpanzu will make his 50th appearance for Luton at the weekend. Man in the middle: Gavin Ward. Experienced official who has taken seven games this season, showing 17 yellows and just the one red so far. Had 33 games last year, brandishing 121 yellows and nine reds as he had the whistle for Luton’s 3-0 win over Mansfield in November. Prior to that, took Luton’s 2-0 FA Cup win at Nuneaton in November 2012 and in the same competition, Hatters’ 1-0 defeat at Southampton in January 2010. Also reffed Town’s 3-3 draw with Bournemouth in League Two in December 2008 and the 0-0 draw with Carlisle in League One during November 2007. Assistant referees are William Bull and Lloyd Wood. In charge: Mark Yates - 45-year-old who had a successful playing career with the likes of Birmingham City, Burnley, Lincoln City, Doncaster Rovers, Kidderminster and Cheltenham Town. Retired at the end of the 2004-05 season and became first team coach at Burnley, before being appointed manager of Kidderminster in January 2006, leading Harriers to an FA Trophy final. Was named Cheltenham boss in December 2009 and guided them to the League Two play-offs twice before he was sacked in November 2014 after almost five years in charge. Spent six months out of the game, until he became Crawley boss on May 19 following the clubs relegation to League Two. View from the opposition: Mark Yates talking to the Crawley Observer - “Our season started after 11 games, so it’s vitally important we build on last week, we build on the goodwill and the support our fans have been giving us particularly here whilst we haven’t been getting the right results. “It’s important we give them something to shout about again and pick something up out of the game. One to watch: Gwion Edwards. 22-year-old Welsh midfielder who has been in fine form this season, scoring five goals already, including two in the 3-0 win at Newport. Started at Swansea City before a loan stint with St Johnstone and then headed to Crawley temporarily before making the move permanent in July 2014. Netted the winner against Luton last time out when the sides met in the Johnstone’s Paint Trophy, while has represented Wales at U19 and U21 level, called up for the senior international squad too recently. Friendly faces: Centre back Magnus Okuonghae was with Crawley for six months in the 2006-07 campaign, making 21 appearances, scoring twice, before being snapped up by then Dagenham & Redbridge manager John Still. Scott Griffiths spent two months on loan at Crawley during the 2010-11 season, making six appearances for the club. Winger Ryan Hall also had a month at the Red Devils in the 2007-08 season, scoring two goals in seven games. Crawley wideman Luke Rooney was with Luton for 12 months, making 19 appearances and scoring five goals, leaving the club in March of this year. Played for both: Midfielder Andy Drury had two spells at Crawley, on loan and then signing permanently for the club. 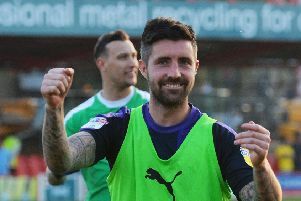 He made 61 appearances and scored nine times before Luton signed him for £100,000 after a lengthy pursuit in June 2014 for his second spell at Kenilworth Road. Was a largely unsuccessful return in the end as he was allowed to join Eastleigh in the summer. We’ve got form: Hatters have never won at Crawley, with a draw and a defeat in their previous two meetings. After a 1-1 draw last time out, Town’s only other visit was a 2-1 defeat in February 2010 as Ben Smith opened the scoring for Crawley, while Matthew Barnes-Homer equalised on 78 minutes. However, Smith bagged his second with three minutes to go as Crawley claimed the points. Last time out: Luton were held to a 1-1 draw at Crawley in their last visit, that a Conference clash in April 2011. Richard Brodie had put the hosts ahead on two minutes, before Alex Lawless replied for Town just before the half hour mark. In the second period, home defender Charlie Wassmer was dismissed on 72 minutes, but Luton couldn’t make the extra man count. Hatters: Mark Tyler, Freddie Murray, George Pilkington, Adam Newton, Zdenek Kroca, Jake Howells, Claude Gnakpa, Robbie Willmott, Alex Lawless, Paul Carden (Matthew Barnes-Homer 80), Jason Walker (Amari Morgan-Smith 89). Subs not used: Kevin Pilkington, Dan Gleeson, Luke Graham.